What’s Happening at the Winters Community Library this week? What is coming up? Read on! 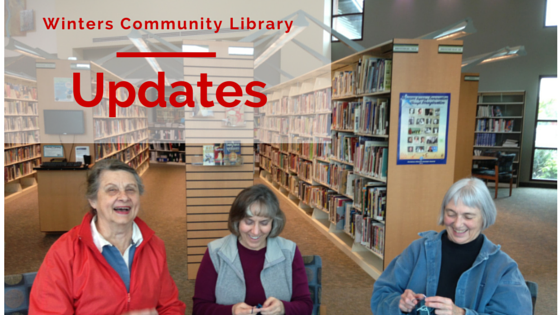 And if you need more information, contact the Winters Community Library at 530-795-4955. The Library is located at 708 Railroad Avenue in Winters. 1) The final Summer Reading Program Gathering aka the end of summer reading celebration party takes place this Wednesday (8/5), from 2-3pm at the library. Come enjoy surprises and a story to share about your favorite book you read. 2) Last day of the Summer Reading Program is August 15. 3) Family Movie Day, is this Saturday 8/8 from 2 pm – 4 pm in the Margaret Parsons’ room. Come be inspired and entertained by a movie based on a true story about a family of whales that gets trapped and how a community rallies to save them before it’s too late. 3) Our extended hours schedule will resume Thursday, August 20.